The Chichester Open Studios Art Trail showcases artists' studios in and around Chichester, West Sussex every May. A profile of Chichesterarttrail.org was found on the social network Facebook. The web server with the IP-address 83.170.119.167 used by Chichesterarttrail.org is run by UK2 Customer and is located in Great Britain. On this web server 30 other websites are hosted. The language of those websites is mostly english. 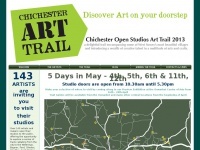 A Apache server hosts the websites of Chichesterarttrail.org. For managing the data of the webpages the CMS WordPress is used. The website uses the latest markup standard HTML 5. The website does not specify details about the inclusion of its content in search engines. For this reason the content will be included by search engines.